The NYC FSBO Closing Process is surprisingly easy as long as you have accepted an offer from a qualified home buyer. Assuming that you have elected to sell via an agent assisted FSBO, you have already cleared the toughest hurdle to selling FSBO in NYC which is engaging the 90% of buyers’ who are represented by agents! Depending on how lenient or strict you would like to be as the seller, you may require buyers and buyers’ agents to present much of this information in the standard REBNY Submit Offer form. It is important to copy your broker when you receive your offer, especially if the offer came from a buyer’s agent because the buyer’s agent will want to make sure the transaction isn’t anything too out of the ordinary. The main reason the buyer’s agent will want to see your listing agent involved is to make sure there is no question as to the buyer’s agent commission which is co-broked in REBNY’s RLS. Remember, when dealing with buyers’ agents in NYC there is no need to let them know you’re not paying full commission! Congratulations on pricing your property correctly if you’ve received multiple offers and now need to choose one. It is common for sellers with multiple interested bidders to hold a best and final offer process where all interested parties are asked to submit their best bid on a pre-determined date. The cleanest and fairest way to do this would be to provide no information to any parties except that there are multiple bidders involved who are all being shared the same information. Some buyers may simply repeat their original bid and some buyers who really want the property and are afraid to lose out really will “put their best foot forward.” It is a great way to filter for the buyers who want it the most. If you have a sales background or feel savvy enough to provide color (i.e. information) to buyers, you can certainly call them to give them a feel for the competitive process and also get a sense of how hungry each buyer is for the apartment. Keep in mind, you will be dealing with professional real estate agents in many cases who are very experienced in these situations. As with all things sales related, this aspect of the NYC FSBO closing process is more art than science. If you would like an industry veteran to help you run the auction and guide you through the NYC FSBO closing process please sign up for professional broker consulting along with your flat fee RLS listing package. It’s crucial to understand that real estate offers are not binding! It doesn’t matter whether they were made verbally or in writing. A deal only becomes binding for the buyer after he or she has signed the purchase contract and delivered said contract along with a contract deposit to the seller’s attorney! What’s next after accepting an offer as a NYC FSBO home seller? In New York City, once real estate agents have matched a buyer and seller, they generally step out of the picture and let the real estate attorneys handle the closing process. Real estate agents frequently do not even show up on closing day to collect their commission checks (they typically stop by a few days later to pick up their commission checks from the seller’s attorney when it’s convenient for them). With that said, it’s customary and highly advisable (though not legally required) to have a real estate attorney manage your NYC FSBO closing process because the purchase and sale contract in New York City is quite lengthy and also negotiable versus the standard purchase agreements used in other states. In other states where purchase contracts are standard forms, the brokers typically prepare them without the involvement of an attorney at all. The next step after accepting an offer is to request the agents involved to circulate a “deal sheet” to all parties involved. If you are selling via an agent managed FSBO and the buyer is represented, simply ask the buyers’ agent to fill out as much as he or she can and send it to you to fill out the rest. If you have purchased professional broker consulting then your listing agent can complete the deal sheet on your behalf and send it to all parties involved in the transaction. The deal sheet is a standard Excel file which contains the contact information of all parties involved in the transaction as well as an overview of the deal. The miscellaneous information section contains ownership type (i.e. co-op or condo), corporation or condo name, shares / % common elements owned, inclusions and exclusions, storage, closing date, purchase price, maintenance / common charges, real estate tax, assessment (if any), flip tax, financing (contingent, non-contingent, cash), amount to be financed, days to obtain loan commitment, occupants of unit, pets and broker commission. 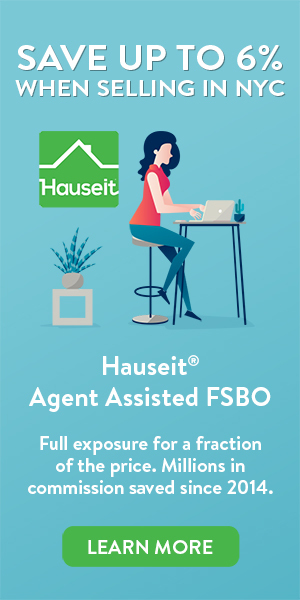 If you have sold via an agent assisted FSBO, please protect the reputation of our full-service affiliate brokers by not disclosing to the buyer’s agent or other brokers how much you paid in seller broker commission. In the broker commission section of the deal sheet it is only necessary to state the commission payable to the buyer’s broker (i.e. 3% commission to Corcoran). After the deal sheet has been circulated, your real estate attorney will begin drafting the purchase and sale contract. The buyer will typically have deference to you on timing and it is usually the seller who demands a quick close. This situation can be reversed if the seller is desperate with a property that has sat too long on the market and the buyer is an opportunistic all cash vulture investor who is willing to walk away. Once your real estate attorney has sent the purchase contract to the buyer’s attorney, your listing status is “contract out” but not “in-contract” yet as it hasn’t been mutually signed. Sellers will typically give the buyer a certain time limit to sign the contract so as to not waste time with an uncommitted buyer. When markets are really strong, sellers have been known to send out contracts to multiple buyers to encourage even more competition. However, this method may be deemed unprofessional in some circles. Your real estate attorney will guide you the rest of the way through the NYC closing process, so make sure you ask plenty of questions as the contract is being drafted and negotiated. Who holds onto the good faith deposit in a NYC FSBO closing process? Also called an “earnest money” deposit, a good faith deposit is typically 10% of the contract sale price payable by the buyer and held by the seller’s attorney in escrow. The good faith deposit can be written in the form of a personal check and is meant to demonstrate the seriousness of the buyer and to encourage the seller to stop showing the property. The good faith deposit is included with the purchase contract after it has been signed by the buyer. When does the home inspection happen? The buyer will typically request a standard home inspection of the property by a licensed home inspector after the deal sheet has gone out. The home inspector will want to also see the common areas (i.e. roof, boiler room, etc.) if it is a condo or co-op. A home inspection is critical when buying free-standing real property such as townhouses or multi-family buildings. They can also be important when purchasing new construction especially if the developer is less well known. Opinions among real estate professionals are divided on the usefulness of home inspections for co-op and condo buyers as they are only responsible for the interiors of their apartments. When does the final buyer walk-through happen? The buyer may request to see the property again after the offer has been accepted. The buyer and/or the buyer’s agent will also do a final walk-through typically the day before the closing to make sure nothing has changed in the apartment. Who typically attends the closing? The typical NYC closing will involve multiple parties representing the buyer, seller and bank if there is a mortgage involved. It will typically take place at the seller attorney’s office if it is a condo, and at the co-op building management’s office if it is a co-op. Expect to see the buyer, seller, buyer’s attorney, seller’s attorney, bank’s attorney and the closing coordinator on that day. How long does it take to close on your sale?